Today is "Blog Action Day - 2008", where almost 12,000 bloggers have each agreed to post on the topic of Poverty, reaching an estimated audience of 12 million readers. We love teamwork and God has given us a heart of compassion, so we are excited to join in on the effort. I have a hard time being brief (as evidenced in my cardboard testimony), but today I want to challenge you to do 3 things. These 3 things may take 5 minutes, but could make a significant difference. in your life and in the life of another. Lights (God's word is a light that guides our steps): Read the example Jesus shared about how a person who loves God can share the love of God in a practical way with someone in need... you can read the story of the Good Samaritan here. Notice that when the Good Samaritan was confronted with someone in need, he was moved with compassion, he physically offered to help and he also gave 2 days wages to help meet his needs. Camera (a device that is sensitive to light, brings an image into focus, and translates it for viewing): Take a snapshot of your heart for helping meet the needs of the orphan. I love that statement from Bob Pierce, the founder of World Vision, who said "Let my heart be broken with the things that break the heart of God." Does a snapshot of your heart reflect God's heart? Are you moved with compassion when you read statistics such as: 80% of humanity lives on less than $10 a day, and 30,000 children die each day due to poverty related issues? Could you pause for a minute to ask God to bring your heart in line with His? Missions-Network InternationalWe just took 5 minutes to walk through these 3 steps, and it was such a good process to walk through. 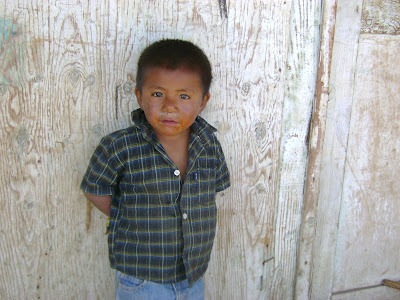 This is a little boy that we met in a slum just outside the village of Uruapan, Mexico. It's amazing to think that our politicians are debating whether Health Insurance should be a Right for all Americans, just like Freedom of Speech or the Right to Bear Arms... when I wonder if this little boy will eat anything today? Will he go to school? Will he be forced into his first job as a 5 year old, to help put food on the table for his family? things we have such an abundance of...hopefully this blog action day will move the hearts of thousands to do something...anything.